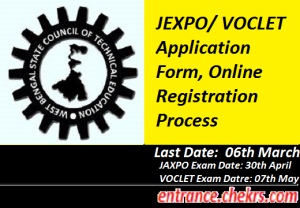 JEXPO/ VOCLET 2017 Application Form: The West Bengal State Council of Technical Education (WBSCTE) has given an invitation to the aspirants to apply for JEXPO/VOCLET Exam 2017. It has updated the JEXPO Application Form 2017 on its official website so that aspirants can get these applications forms easily. The application form is available from 30th January 2017. The last date for the submission of the JEXPO/ VOCLET Application Form 2017 is 06th March 2017. All those aspirants who applicable for this exam they all have to submit their Application Form of JEXPO/VOCLET 2017. Only after submitting the VOCLET Application Form 2017 candidates will be applicable to appear in this exam. The JEXPO/VOCLET 2017 is a state level polytechnic entrance test which is also known as Joint Entrance Examination for Polytechnics. JEXPO/VOCLET exam is conducted by West Bengal State Council of Technical Education. Through JEXPO/VOCLET Entrance Exam, the student will be selected for admissions in the diploma courses offered by different polytechnic colleges in West Bengal. Here Aspirants can also check details of JEXPO 2017. Applying candidate must have passed 10th or its equivalent examination with English, Science, and Mathematics from any recognized board. Candidates should have scored minimum 35% aggregate in the qualifying exam. 10thAppearing students can also apply. There is No upper age limit, but applying candidate’s date of birth should not be after 1st July 2002. There are no age criteria is specified by the authority for VOCLET. Applying candidate should have clearedITI post completion of 10th or should have done 12th with vocational subjects for appearing in the test. Candidate appearing 12thin 2017 can also apply for the VOCLET exam. Candidates meeting the eligibility norms in all the aspects are invited to register themselves for JEXPO Application Form 2017 from 30th January to 06th March 2017. JEXPO/VOCLET 2017 is a state level entrance exam for admission in polytechnic institutions in West Bengal. The West Bengal State Council of Technical Education conducts the JEXPO/VOCLET 2017 EXAM. The JEXPO 2017 will conduct on 30th April 2017 and VOCLET 2017 will be conducted on 7th May 2017. Follow the official website for the accessing the form for JEXPO/VOCLET i.e. (webscte.org). Firstly, you have to fill the registration form of JEXPO 2017 or VOCLET 2017 as per your eligibility. Check all the information before submission of the form. Also, a password can be created for the registration. Now, a scanned image and a signature with a size not more than 100kb will be uploaded. After the submission of the fees, you need to take out the printouts of your filled in application form and money receipt and self-attested them. (A) Before the purchase of the application form, the candidate must make sure his/her eligibility for the respective exam. After purchasing the forms cannot be returned. (B) The information related to the above examinations shall be available in their brochures. (C) Candidate must check their brochures before filling the OMR form. (D) SC/ST/OBC-A/OBC-B/LLQ certificates should be provided by the competent authority of West Bengal. The certificate issued from other states will not be valid for getting the reserved category seats. So, the aspirant of other states should declare themselves as the general category only. If the reserved seats are allotted to such aspirants through counselling, admission to such candidate will not be allowed by the institutions. The application form fee for OMR Application is Rs. 500/- for general and Rs. 250/- for Kanyashree Enrolees. Online application fee is Rs. 450 for general and Rs. 225 for Kanyashree Enrolees. JEXPO AND VOCLET exam is going to be conducted for the candidates looking for the admission in diploma programs in engineering offered by the polytechnic institutions located in West Bengal. Results for the JEXPO/VOCLET EXAMINATION will be published in June 2017 as expected; however it can be or can’t be changed. The exact date will be provided to the aspirants once the official notification regarding the result will be provided from the examination conducting authority. If you have applied for the JEXPO/VOCLET 2017, this is the right time to download e-admit card. Candidates will not be permitted in the test without their admit card. As by the latest notification released by the exam conducting authorities, the candidate can download their admit card from May 2017. All the candidates are advised to take a printout of their admit card as you’ll be asked by the invigilator to show your admit card, if you will fail to do so you will be restricted from appearing in the test. JEXPO/VOCLET is also known as polytechnic entrance test, it is a test organized by West Bengal state council of technical education for the candidates looking for admission in different diploma programs. JEXPO/ VOCLET Application Form 2017 will be accepted between the dates 30th January to 06th March 2017. JEXPO 2017 and VOCLET 2017 exam will be conducted on 30th April 2017 and 07th may, 2017 respectively. Admission for the first year diploma courses will be based on the merit of JEXPO 2017, whereas, the admission of the second year will depend on VOCLET 2017. For further queries or exam related issues, you are invited to contact us by leaving your comments at the end of the post.